This is a book I needed to read.Just some background on me: I've been a Christian pretty much my whole life though I went through the expected doubts in my teens...and twenties...and occasionally today. I went to seminary and read lots of theology and Bible. We learned theology in systematic theology class. We also were exposed to so-called "contextual theology" at some point: feminist theology, liberation theology, etc. As mostly white males, we didn't notice our own context. Others were contextual, we were not. Or so we thought.I've been trying to break out of this bubble and have benefited from reading James Cone recently. There have been other books and blogs and thinkers on Twitter. This book by Sallie McFague adds to that journey out of the bubble. Its a great book. 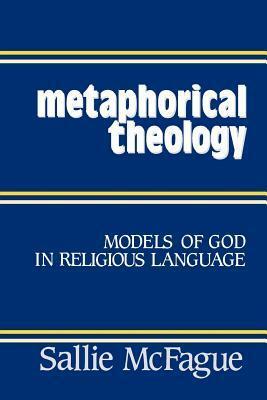 McFague develops what a metaphorical theology would be by discussing models and metaphors and the like. She looks at what models in science do and how that is similar and different from theology. Finally, she discusses God as Father, one of the defining metaphors of Christianity. In this she notes that feminist theologians have a variety of views, some want to totally move away from Christianity to a different religion focused on God as Mother, others want to reform Christianity from within while getting away from language of God as Father while others simply see a need to redefine what Father means. Overall, this is a helpful book. Not just a helpful book to check off a box, as if a white male like me can read a feminist theologian and feel sufficiently progressive. I mean, McFague is a good theologian in her own right, not because she's female but because she's thoughtful and has good stuff to say. I don't want to pigeonhole her. That said, white male Christians like me ought to be reading women like McFague and black men like Cone and so many others. So I recommend this one for anyone who likes reading theology, especially for men who like theology but haven't been exposed to feminist theologians. Wow. Sallie McFague's work of feminist theology has been in this world for 36 years, and it badly needs a wider reading. Published in 1982, it remains as fresh as ever – perhaps fresher in this age of #metoo and increasing awareness of the ways sexism and patriarchy have stymied gender equality. Metaphorical Theology is a slim volume, but packs a heavy punch. It seeks to dethrone "God as Father" as the primary "root-metaphor" of Christian belief and replace it with something less patriarchal.First, McFague lays the groundwork by exploring the importance of metaphors for human learning – based on her copious citations, she's synthesizing many voices but not breaking new ground, which doesn't make it any less mind-blowing for those of us unfamiliar with the research. She argues that metaphors are the foundation of human thought: All learning requires interpreting new data in light of previous experiences, seeing "this" as "that." Groups of metaphors combine to form models, and these models provide the basis for the Bible's relational depictions of God and humanity.With that basis, she seeks to create what she calls a "metaphorical theology" – one that describes God with the inherent relational and imprecise characteristics of metaphors. Such a theology, she argues, should rely on a metaphor for God that subverts, rather than entrenches, the patriarchal assumptions that have become entrenched in Western society. She settles on, and makes an excellent case for, the metaphor of God as friend. No doubt this decision will incur (or has incurred) pushback – the notion of Jesus as our friend has certainly received its share in recent years – but McFague supports it well, both with biblical references and practical exploration of its implications. The primary takeaway for me was McFague's exploration of the nature and purpose of metaphors – their inherently relational nature, their use in Jesus' parables and the possibility of seeing the life and death of Jesus as a metaphor for God. The primary shift in my thinking sparked by this book is that the biblical metaphors for God should not be seen as describing the divine nature but rather the divine-human relationship. Thus describing God as father is not a description of God as somehow inherently male or patriarchal but a metaphor referring to certain aspects of our relationship with God. Such a perspective allows for a greater variety of metaphors while also limiting our tendency to standardize one image and turn it into an idol that stands in for God.I could go on and on. Obviously, I found this book terrific – I learned a lot, and McFague writes with a clear and compelling style (although I would still caution general readers that this is definitely an academic work). The only thing keeping this from being a five-star book is that the third chapter, which discusses the use of models in science, is completely skippable – I know because I skipped it after two pages and didn't miss it. Aside from that, however, this is an incredible work of feminist theology, and well worth the read for those seeking a more inclusive way of thinking about God. Far beit for me to question a Vanderbilt doctor... Na, I take that back. That's exactly what I'm going to do. I appreciate the impulse and aims of "Metaphorical Theology," but feel that this book falls far short of its intention. At best, I would say that McFague's account is drastically incomplete.The book's arguement: Metaphor is essentially the way we think, not just on the theological level, but even on the most commonplace. To say "this is a chair," is ultimately a metaphorical statement, which could be expanded into, "I've seen many objects called 'chairs' and the one I'm looking at now shares the same qualities, thus this too is 'like' a chair." She argues that we never perceive things directly, but always in terms of similarity and dissimilarity. Example: we can't simply observe a tree because we have to observe the tree through our metaphorical judgments. Our perception of a tree is "prejudiced." It's not simply "this is a tree," but this is like other trees, and not like other trees.When she turns to theology, her contention is that the recognition of metaphor as the base of all thinking, the element of this "is and is not like," can eliminate literlaism or simple identification, thus freeing religious language to be imaginative and inclusive. God is not a Father. God is like (and not like) a father. My critique: She ignores a hole that's too big for me to ignore. -A metaphor is a comparison/relation of two partially known things. However, if that's true, how can we include God in a metaphor? For she also says that we can only know God indirectly through metaphor. It's a closed circle that we cannot get into. Consider the difference: We can say, "God is like a rock," and we will assume that God has the qualities of a rock (i.e. sturdiness, reliability, strength, etc). But how does the inverse work? "A rock is like God." Well what the hell does that mean? We don't know anything about God in God's self. The metaphor only works one way, which makes it not a comparison of attributes, but a transference of attributes. In the end, this approach falls decisively dead beneath the Freudian critique (we create God as we need God to be). No! Any viable theology needs the element of revelation or epiphany. Some way of claiming that God can be known, at least in part, apart from our own wishful thinking. this was a revelation for me. after two years of biblical study and theology, this book opened a new way of thinking for me. by discussing the way that even language is a metaphor for the thing it names or describes, mcfague develops the understanding of the way all our 'god' language must necessarily be metaphorical.from there i found a new freedom in thinking about and experiencing god in all aspects. i must begin with an inner idea and from there i work to find ways to speak of what is always ineffable.what this means is that so much of what is the language of faith is best approached as a cultural construct, working to name and describe things which are beyond words. for me this has become foundational to how i think of and try to talk of my own religious life. and it has made the task of communicating to others both more excitng and more challenging.the hardest thing for me now is to work with trying to find the meaning behind the metaphors which others use, often without realising. that way i can begin to share something of their experience of the spiritual.this remains one of my favourite theological texts. Sallie, a theologian feminist speaks about somes fondaments metapohoric in religious thinking. Dia banyak membantu juga dengan kritis memeriksa bahasa-bahasa teologis yang bias gender dalam kristianisme. It hurt my mind. In a good way. Sallie McFague - Dr. Sallie McFague is an American theologian.